. . . and babies make four. : On the fifth day of Christmas . . .
On the fifth day of Christmas . . .
Have you ever seen something really special and you just, well, swoon? That's what I did the moment I saw these beautiful handmade silhouette ornaments from 'ohana by Lea. Lea, who was once a teacher, is a skilled jewelery artist who lives in Arizona and makes lovely jewelry. She also makes these amazing ornaments. 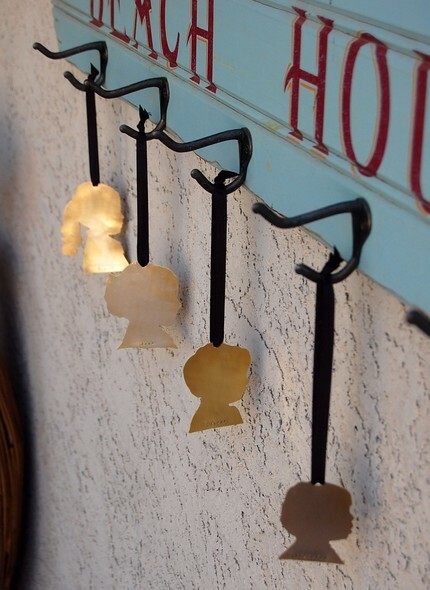 Each silhouette ornament is made one at a time and hand cut with her jeweler's saw from a strong piece of brass sheet. The ornament is then be engraved with a name and/or date. She is making the ones I ordered for Michal and Kenna right now. I can't wait to hang them on our tree. In fact, I think I just might keep them out all year long. And the best part? Lea is going to give one of these beautiful ornaments to one of you! Go ahead, swoon. All you need to do to enter is visit her store and then come back and tell me something that caught your eye. Please note that Lea is already busy working on her holiday orders so the winner will not receive their ornament until after the New Year. This giveaway will remain open until 12:00 midnight on December 11. I love the beach treasure locket. I have a small shell from my daughters hometown beach in China. im going to ask if she can make something up. Well yet again another beautiful site. I really like the sand dollar necklace and the cut out starfish. Thanks again for sharing these sites with us. What a wonderful ornament. I also loved the cut out starfish. She is really talented. That reminds me of the paper cutouts we received in China in one of the parks in Guilin! I loved this site, and my fave would have ot be the Chinese Zodiac Mother's Necklace. Can't wait to see your new ornaments! The silhouette ornament is beautiful. Many pretty things on the site but none of more uniqueness than this for me. I will be ordering the Stamped Grandmother's necklaces later today. LOVE IT! Your suggestions have helped GREATLY with my shopping this year! Please keep the links coming! Oh her work is amazing! I love everything! The ornament is my favorite though, what a personal gift! Absolutely beautiful! Love the monogram pendant necklace! I love all these great gift ideas! I love the Sterling Bar Tag Necklace! Oh goodness! She is talented. I must say, the ornament is my favorite though. I LOVE these silhouettes! They are a must have. I also think her open circle necklace and the beach locket are cute and fun. There are so many talented women on Etsy. I do love the ornament, but I also love the family tree pendant with the names engraved on the outside! Wow is this one hard to answer. There are so many beautiful items to choose from. I think my favorite might be the You are the Moon and Stars Stamped Necklace. Oh, I love the sweethearts necklace. I may just have to place an order now though!!!! LOVE IT! I may have to get these for my children. I love ornaments in general, but these are awesome. A very creative way to capture a time in their life. I loved the saw pierced etched sand dollar necklace. Sand dollars hold a special meaning for me and my man. Thank you for introducing us to all these great Etsy shops! I'm pretty traditional and love the silhouette ornament. It would be a wonderful keepsake. The Child's Silhouette Pendant Necklace-- this mommy loves how classic it looks! Not to mention having my sweetie always close by! EVERYTHING there is amazing, but the custom ornament has to be the most swoon-worthy! I'm with Kim, you're killing me! Suddenly my Christmas list is GROWING by leaps and bounds! I just ADORE the Customized Etched Sterling Bracelet with your kiddos artwork, how incredibly special!! Great etsy shop....thanks for sharing. It so hard to choose a favorite but I think I would have to say the silhouette ornaments are my favorite. This necklace would be an heirloom! I'm with Kim and Stefanie too. This is killing me...all this wonderful shopping and all ;) I really LOVE the "have faith" necklace. Just beautiful! But, actually, I LOVE them all. I liked the You are the Moon and Stars necklace, but again, anything from her shop would be a treasure, wouldn't it? What beautiful ornaments! I am going to have one made of my daughter. The child's artwork and bracelet caught my eye and I'm going to keep that in mind as well. The mother's necklace with the birthstones is beautiful! Love all these Etsy finds... I've bookmarked each of them for future reference!!!! She makes silouette charms for necklaces, too! That caught my eye! Very creative! I have silouettes of the kids that were cut by an artist out of black paper from Disneyland...I treasure those. It would be great to have them in brass! Those are amazing. I am in love! My favorite is the Miracle charm. Perfect. What great gift ideas. I love the multi-strand sea glass. I'm swooning over the angel wings pendant necklace. SO lovely! I LOVE learning about all of these favorite things! What a great idea for ornaments for a tree. This is Tate's first year celebrating Christmas (last year she was in China) and this would be an amazing keepsake to commemorate this. you are spoiling us! i thought the heidi klum and seal necklace was fun! Such talent. Well let's see I loved the Your Child Silhouette necklace, it reminded me of a bracelet my Grandmother used to have, the Whale of a necklace, the Mother and Child Quote necklace and the Hand stamped Mothers necklace. Oh and yes, the ornaments are beautiful. Thank you for a link to another talented Mom! Thanks for entering my name! these are amazing...I am loving logging on here and discovering all the great stuff you have found! The family tree cut out necklace is beautiful! the mother and child necklace is something for my daughter and two granddaughters. her work is so unique. thanks again. I love the family tree cut out and may need to get one for our family. what a beautiful website thanks for sharing. I have bookmarked each site each day and look forward to seeing what you have in store for us. thanks Krisit! How absooutely beautiful her work is! I am loving the personalized mother's bracelet!! The silhouette ornaments are breathtaking, what a wonderful keepsake! Wow - what neat pieces!! The "Family Necklace with Rectangular Tags" caught my eye and I think I will place an order. It is so neat and my sister would love it!!! I find myself drawn the Open Circle necklace! I love all of her stuff, but I think my favorite is The Mother Child Quote necklace. The silhouettes are also very cool! Oh my word, I wanted to do small framed silhouettes for ornaments this year but haven't gotten that accomplished yet. In addition to the silhoueetes, I like the open circle necklace and the cinderella charm necklace. Oooh! I love the silhouette necklaces. You find such great websites! I love the ornaments and also the open circle necklace. This is just so much fun! And yet again, I love the ornaments! How beautiful and priceless! I would have to say one of my favs is the stamped mothers necklace! The silhoueettes are by far my fave, but I liked the stamped bracelets for children as well. The silhouette ornaments are by far by fave, but I like the stamped name bracelets for children as well! Wow, everything is beautiful, but I know that my daughter would love the Mermaid Bracelet with the Black Pearl. Now I know what to get her for her birthday next year! What a great store, I have had it bookmarked since I read it on Nie Nie. I love Personalized Chinese Zodiac Mother's Tag Necklace and of course the silhouettes are so adorable. Oh my. I love the Angel Wings Scripture Pendant Necklace. I think I may just have to have this. What a beautiful site. 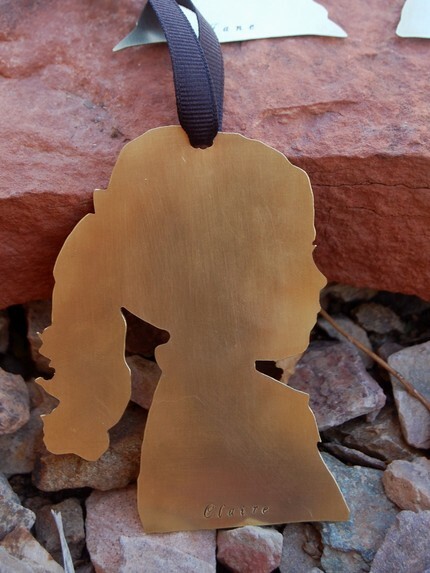 I love all of it but if I could I would LOVE to have a silhouette ornament for each of my children. I love the silhouette ornament. Classic. The Silhouette ornament is my fav! All of it is beautiful! You are so sweet for doing this fun 12 Days of Christmas!! These are amazing....the silhouettes are my favorite!!! I love the bracelet with her daughter's artwork and profile! So clever! Her work is amazing! But i have to say the ornament is still my fav. I really liked the angel wings scripture pendant. It's just beautiful. I like the 4 agreements necklace! These are precious. Immediately got my creative juices flowing! Thanks for sharing! I would love to win the silhouette ornament! We are adopting from China. The sweetheart necklace and the tree ornament. Just adorable and she is so talented! I love the elegance and simplicity of the Open Circle Necklace. I hope I can get lucky and win at least one of the 12 days giveaways. I never win anything, but I can't win if I don't play, right? I just can't get past the silhouettes. They are just adorable. You have picked the best. I can't believe how much the price goes down when you order a bunch! Even if I win I will have to buy at least one more this year! I love the custom silhouette ornaments. What a great site, I especially loved the "You are the Moon and Stars Stamped Necklace"
Wow, so many beautiful things! I love the You are The Moon and the Stars Necklace...gorgeous! I like the silver initial pendant. Love the cut out starfish! So unique! The ornaments are adorable - what a special piece to hang on your tree! What great ornaments! I like the have faith necklace, too. Again...too many choices to settle on one! I suppose my pick would be a sterling spaced stamped necklace with birthstones. A difficult decision. I love the sillhouettes - ornament or necklace charms! I have a terrible feeling I am about to drop some cash! I love the artwork and silhouette bracelet! Those ornaments are so beautiful. I also love the "have faith" necklace. I've never seen anything like this ornament. Too bad I didn't find it in time for this Christmas. I also really like the Chinese zodiac tag necklace. The ornaments have to be my favorite. She is very talented. Ohhh, I love the moon & stars pendant necklace. I always tell my daughter that she hung my moon. It's just perfect! Beautiful! I love those ornaments. I love the necklaces in her shop- especially the one inspired by Heidi Klum and Seal- really cute! Wow. Beautiful pieces! I really loved the Double Layer Love necklace and the Have Faith bar tag necklace. Love the artwork etched on the bracelet charms.... any and all the silhouette pieces. I refuse to choose one from this site. I love her work and just ordered the Beach treasure necklace. But the ornament is amazing.